Every Yoga Teacher has a message to share. What better way to live your fullest potential and learn how to shine your wisdom as a teacher than with Kelly McHugh’s upcoming yoga business retreat ‘The Online Yogi' - Yoga Teacher Retreat & Training in Bali. 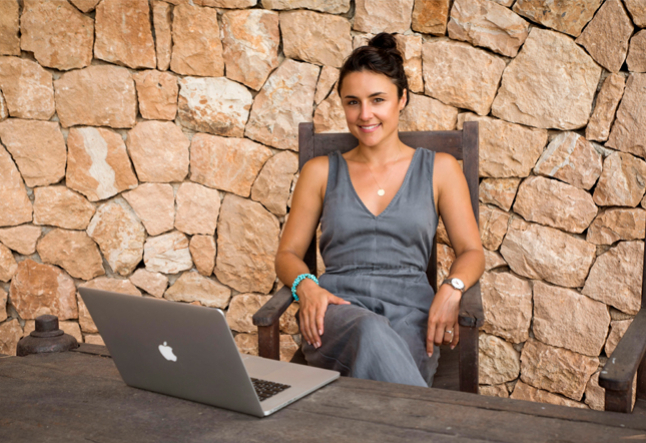 Yoga Teachers looking to take their business online can enjoy 7 Days in Bali starting 10th February, and Kelly is giving our YOGI TIMES readers $500 off as a special gift. Founder of Digital Yoga Academy, Marketing Professional and Yoga Teacher, Kelly McHugh leads this upcoming retreat with innovative learning and business growth strategies. She will be sharing approaches with proven results when it comes to content creation, digital marketing and using technology with ease. Kelly brings the perfect blend of marketing and yoga teaching expertise so you can bring your yoga business online. Kelly spent more than 15 years working with startups, global businesses, and agencies managing multi million pound budgets for marketing teams. Yet, she keeps her teachings closely related to yoga, offering practical advice during classes, studio, privates or retreats abroad. She is a pioneer in yoga business and marketing education, sharing tools and techniques to teach professionally online - all taught with her vibrant, energetic and fresh teaching style. Kelly is an expert business coach, and will show you how to brand your yoga business in a way that resonates with your ideal students. You will learn about the top yoga niche’s and branding strategies, and be shown the step-by-step process for launching successfully online. This retreat is perfect if you are thinking of launching your yoga business online, or would like to earn additional income without having to do more studio classes. Plus, the tropical setting of Bali is as close as you will get to vegan heaven - imagine 7 days of paradise finished with an elevated business. Take the next steps in your yoga career by joining The Online Yogi Yoga Teacher Retreat in Bali 10th February 2019. Gain the knowledge and inspiration to teach at your very best, extend your business and extend your passion! To get $500 off the retreat price email Kelly directly at kelly@digitalyogaacademy.com quoting YOGI TIMES. Not able to make it to Bali this time? YOGI TIMES UNIVERSITY allows you access to Kelly McHugh’s full business coaching skills from the comfort of your home with her online course Teach Yoga Online.